Let's start with the good news: there is (almost) no difference between the way that we write numbers in Spanish and the way we write them in English. The bad news is that when we use numbers in conversation, they definitely aren't pronounced the same way. But whether you've picked it up from Sesame Street or Dora the Explorer you probably already know at least a handful of Spanish numbers. Keep reading to learn more. A "cardinal number" is just a fancy term for a numbers we use in counting things (or indicating times, dates, or ages). Let's take a trip through the Spanish cardinal numbers from cero (0) to un trilión (1,000,000,000,000,000,000) noticing some interesting quirks along the way. Fun Fact: Cinco is the only Spanish number word with the same number of letters as the number it represents. *Note: There are two acceptable options for writing the numbers 16 through 19. The "old-school" way is to simply say "ten and six," "ten and seven," etc. The newer method is to combine those words into one word. At that point the "z" in diez becomes a "c" and the "y" becomes an "i." Both versions are pronounced the same way. The shorter, combined word is preferred nowadays. *Note: Once again it is also preferable to condense these numbers down to one word by replacing the trailing "-e" and the "y" with an "i." Twenty two, twenty three, and twenty six will also need an additional accent mark. *Note: After the twenties we no longer condense our numbers into one word. Chad Johnson knew football but his Spanish needed a little work. You may have noticed there is no longer any y." This is because the "y" is only used to separate the 10's place from the 1's place. If there is nothing in the 10's place, we don't use "y." *Note: In compound numbers, Use ciento if the number that follows is smaller than 100. Use cien if the number that follows is larger than 100. *Note: This is not actually so much of a difference in languages as it is a difference in ways of counting very large numbers. Historically there is some disagreement even between English-speaking countries as to what exactly a "billion" represents. If you're simply counting numbers (like in "Hide and Seek" while your friends are hiding) the list above is accurate. However, much of the time when we use a number we follow it up with a noun, e.g. "six cars," "24 tables," "38 houses," etc. When we do this we're actually using the number as an adjective and some interesting things need to happen. Every part of a number that can agree with the gender of the noun should agree. For example 654,321 tables would be written out as "seiscientas cincuenta y cuatro mil trescientas veintiuna mesas." You may have noticed the strange looking decimal points in the right hand column above. This is not a typo. The majority of Spanish-speaking countries do the opposite of English-speaking countries when it comes to decimal points and grouping thousands: commas are used for decimal points and periods are used to separate the groups of zeros. The number "21.7" would be written "21,7" in Spanish and would be read "veintiuno punto siete." When used as adjectives, all of the ordinals agree in gender with the noun they modify, therefore "-o" endings change to "-a" with feminine nouns. For example: la segunda casa, su tercera novia, mi última tarea. The ordinals primero and tercero are shortened to primer and tercer when used with masculine nouns. For example; en primer lugar, en tercer grado. This is only true of primero and tercero. When an ordinal prefix ending in "-imo" is combined with "octavo" one of the o's is dropped to avoid repeating the same sound, e.g. "decimoctavo." 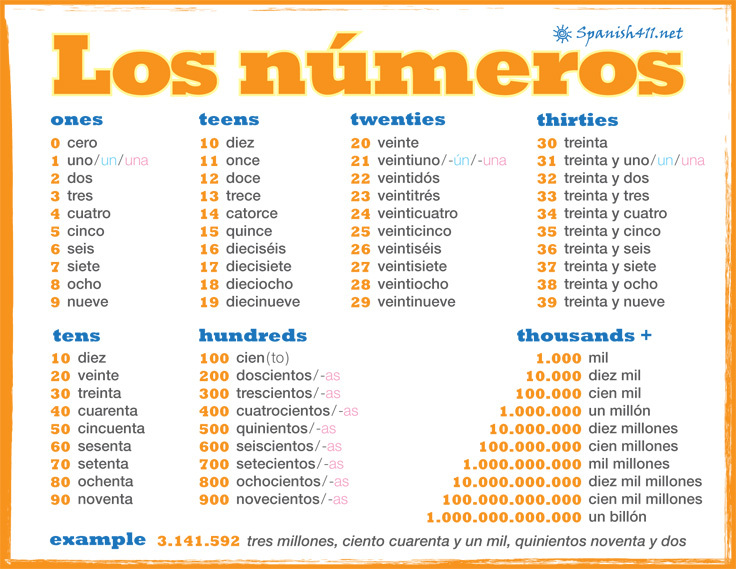 Ordinals are not typically used with dates; use cardinal numbers instead: "Hoy es el quince de enero." From "un cuarto" on we're using the same words as we did for the ordinals. Note: Multiples can also have masculine and feminine forms: cuádruplo, cuádrupla. "El 60 por ciento de las veces funciona siempre." Precentages are written the same way in Spanish as they are in English. When spoken, "percent" is por ciento. When writing checks in Spanish it is acceptable (and a good idea) to write "un mil" rather than the grammatically correct "mil" to ensure that no one alters the check amount.